When writing a review of the book Itty-Bitty Hats: cute and cuddly caps to knit for babies and toddlers by Susan B. Anderson, I fell in love with the Baby Marley Hat pattern (see previous post for the full review). I knew that I needed to cast on immediately. 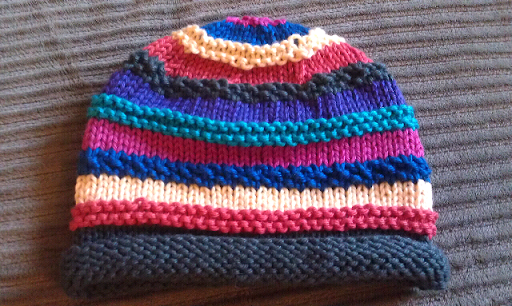 I knit the 0-6 month size hat with Shine Sport yarn on size 6 knitting needles. 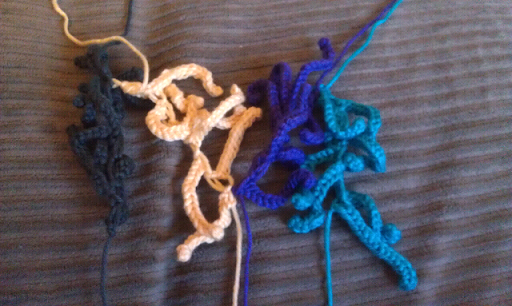 I used 7 different colors, but decided to do a different color progression that was in the pattern. I didn't preweigh each of my shine sport colors since I don't remember what many of them actually are. Plus, many of these colors are discontinued anyway! 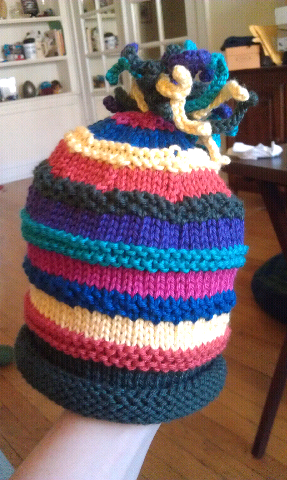 I will weigh the hat at the end to get total yardage. 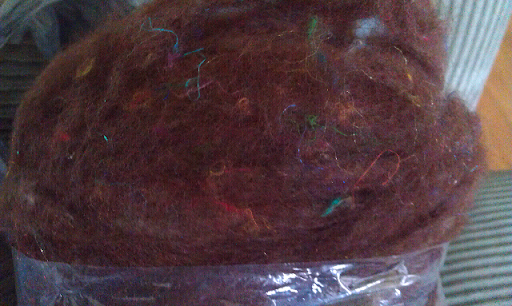 Before weaving in loose ends (and before embellishments) hat weighs 34 g. Before weaving together, the topper weighs 12g, so 46 g total consumed. 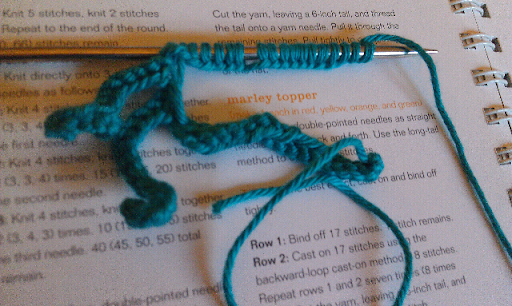 The way the topper pattern is written, you end up with one end of the yarn at the point of a curl. 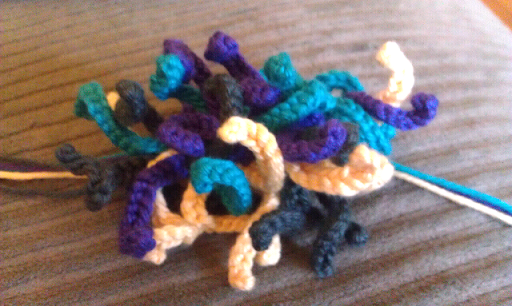 This is going to be a pain to weave back through, and will be little help in securing the curls to the top of the hat. Therefore, Rather than making each of the 4 pieces separately and then coiling them together, I made all 24 pieces on one long strand. 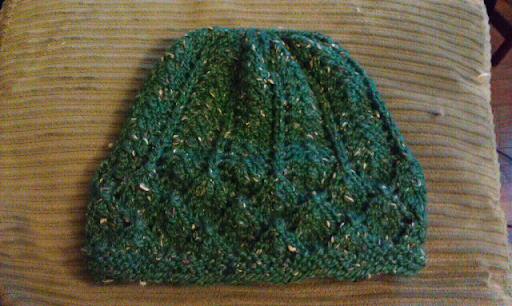 I also didn't turn and knit the last stitch left on the needles before each cast on of the topper. This kept the curls pointing in alternate directions (it looks a lot like seaweed) which I think will help keep things more "random" once I sew them down. 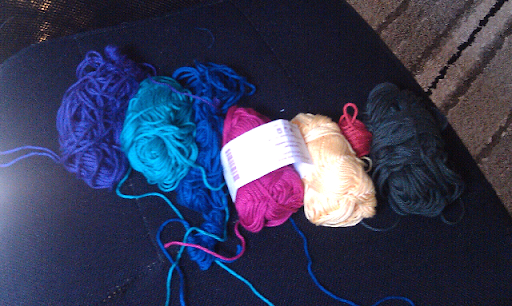 I selected the colors green, yellow, purple and teal for the topper. I would have loved to use the terracotta orange, but I ran out of that color on the body of the hat. I don't really know how to describe how I sewed the topper together, but here are some pictures I took of the different steps. Once I had threaded each little piece together, I pulled the yarn tight and tied the ends off... BAM there was a perfect little Marley topper. My only complaint with the book is that I would have liked to see final measurements for each of the hats, or at least seen a section on sizing for babies. I know this hat will fit a baby no problem, but I am not sure how young of a baby it could work for. Itty-Bitty Hats: cute and cuddly caps to knit for babies and toddlers by Susan B. Anderson is a delightful little book featuring 36 baby hat knitting patterns. This is a book written with beginners who want to start trying other techniques in mind, and provides an excellent reference section. The book starts with an introduction sections "What you Need" and "Let's Knit." These sections bring you through materials you will ened to create these itty-bitty hats and how to do the techniques found in this book. Detailed instructions with pictures are provided for basic knitting, crochet and even embroidery stitches (the ones that you will need in this book.) There is even a pompom tutorial! Have I ever mentioned how much I love spiral bound knitting books? It is so much easier to knit from a book when you can lay it flat! When you start to move into the patterns, you enter a section of simple hats. To the experienced knitter, this section may be a bit of a let down, but remember that this book is geared to people who are just starting to knit in addition to more seasoned knitters. This is a fantastic book, you can bet I will be checking this out of my library again! 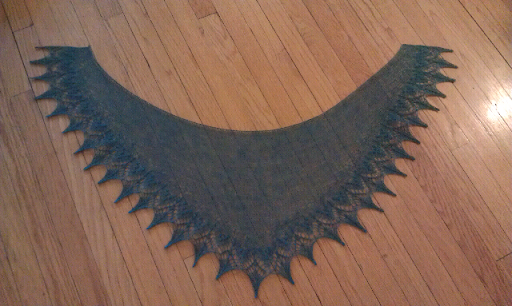 I am in love with Susanna IC's crescent shaped shawlettes. 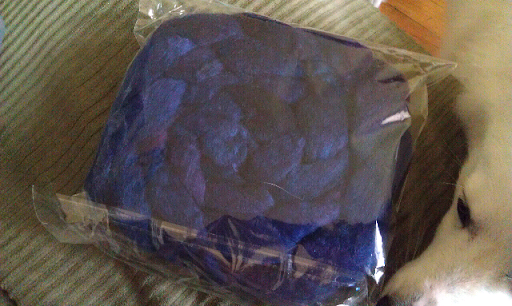 When she decided to do a choose your own crescent knit along starting at the end of February, how could I resist? 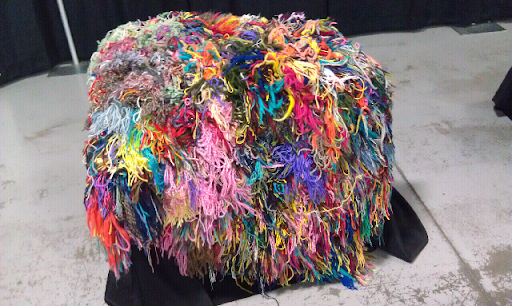 I wish that it were another mystery KAL, but you cannot get everything you want. 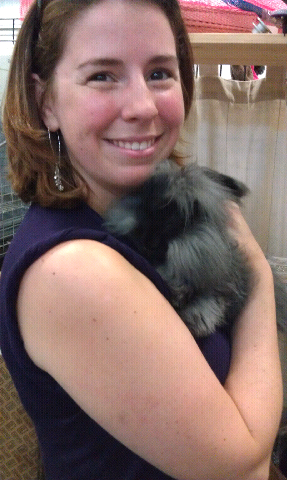 This was a perfect chance for me to try Annis. 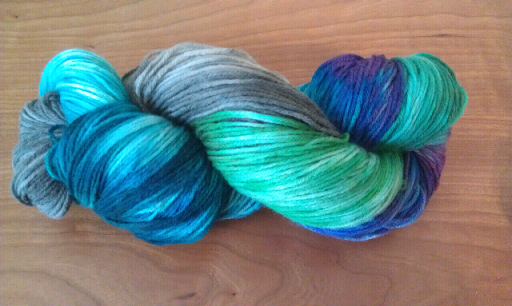 I was excited to use the Alpaca Cloud (color tidepool heather) from my stash. 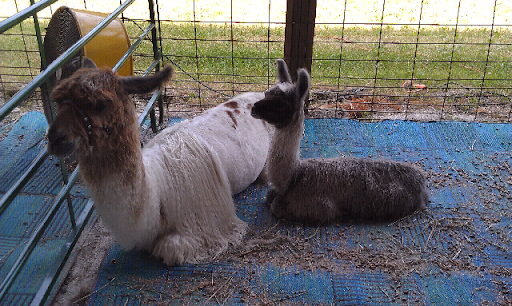 I love alpaca yarns, and am hoping to use this yarn line for a larger shawl later this year. 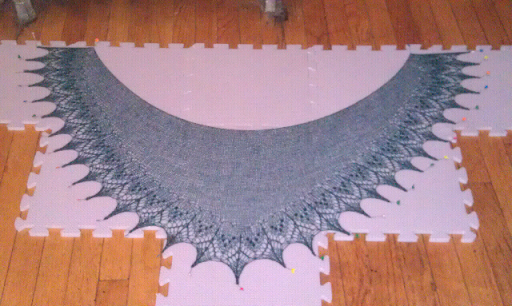 The lace portion of the shawl looked really small. 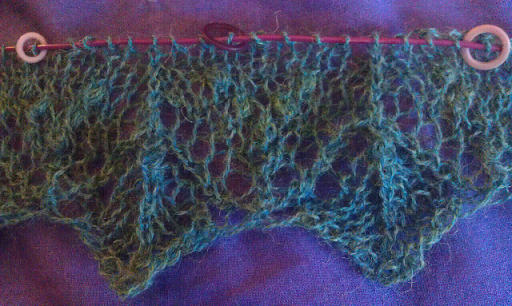 Alpaca Cloud Lace is a bit thinner than shadow lace. 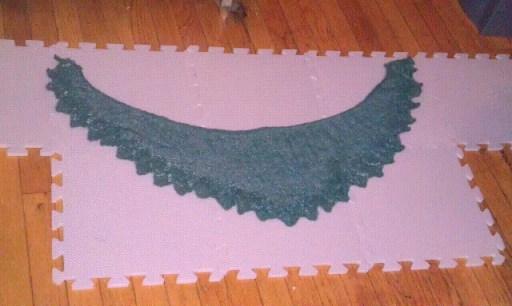 Blocking is magical, and made it a reasonable sized shawl. 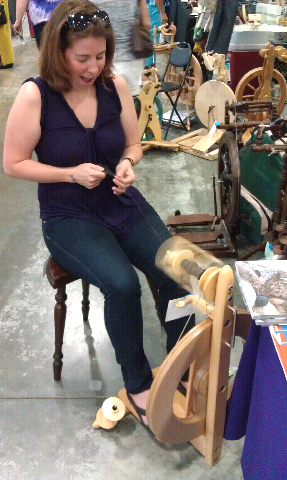 In March I joined the 12 shawls in 2012 group on Ravelry. It is a fun group and there are a lot of people who share their pictures of completed projects. There are even random drawings for prizes for each of the 12 months. This month, my yardage concern was not that I would run out of yarn.. but that I would use enough yarn in my shawl to be able to count it! This project made be fall in love with nupps. I love the way they stand out, and am so happy that I chose nupps rather than substituting with beads. 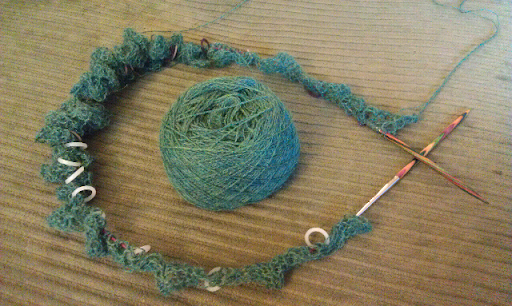 If I make this shawl again (with this yarn) I would add more repeats. 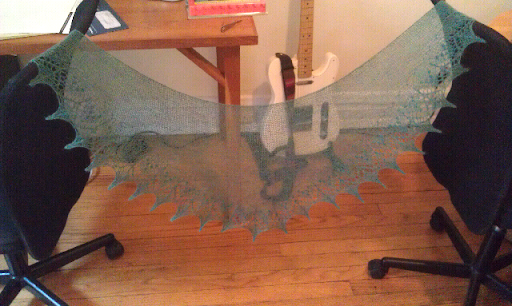 The shawl is as delicate looking as a butterfly wing. I like that it is so transparent, but still will have some warmth! I am becoming addicted to test knitting! 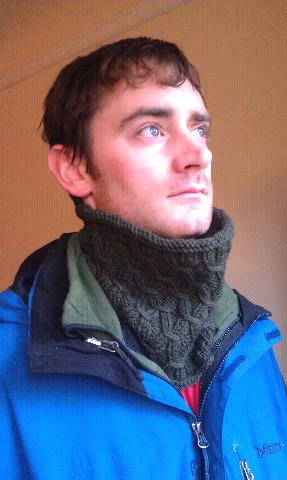 The Ziyal Cowl is a beautiful pattern that I think would work for a man or a woman. I have never tried smocking before, and agreed to test as soon as I looked at the amazing smocking tutorial the designer made. 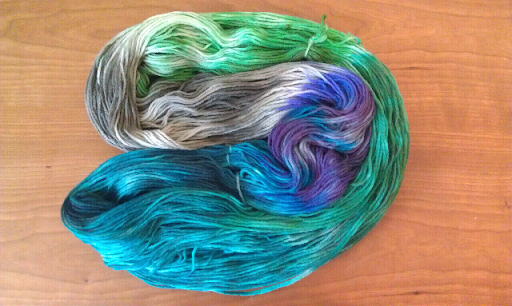 I used KnitPicks Wool of the Andes yarn in Evergreen (68 g, 150 yards) and size 8 knitting needles. I like to provide a swatch photo for the designer whenever I test knit an item, especially if I am using different yarns. 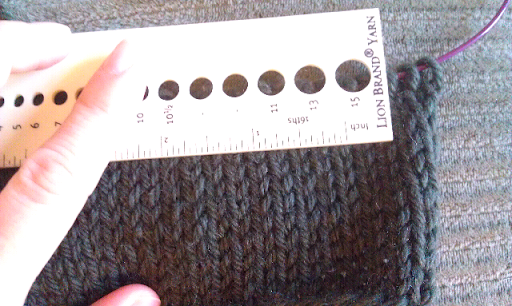 They yardage consumed in a test knit is very important, in fact I think it is possible the most important feedback you can give to the designer. 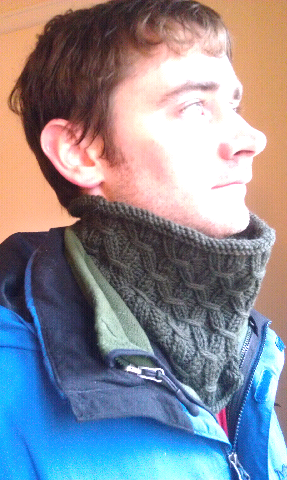 If I had made this cowl 5 years ago, I probably wouldn't have blocked it. The way it came off the needles it fit like a turtle neck. 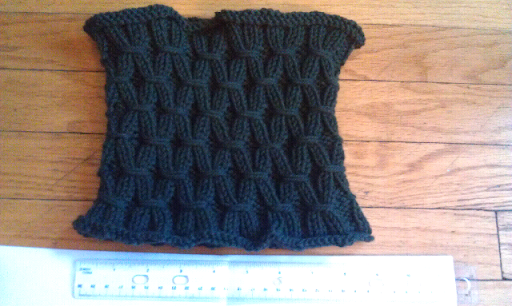 I think the cowl looks much better once blocked. 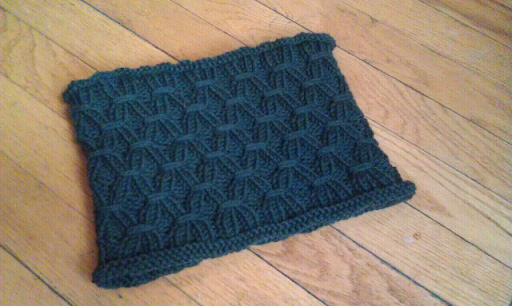 I think the cowl came out amazingly well. I'm glad the designer liked my suggestion that the rolled edges be knit on smaller knitting needles to help them keep their shape better. 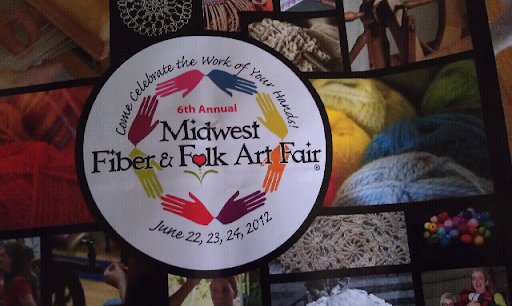 It was such a pleasure to participate in this test knit! This pattern is so simple to knit, but it looks like it is very complicated. With the help of the tutorial, any beginner could complete it! 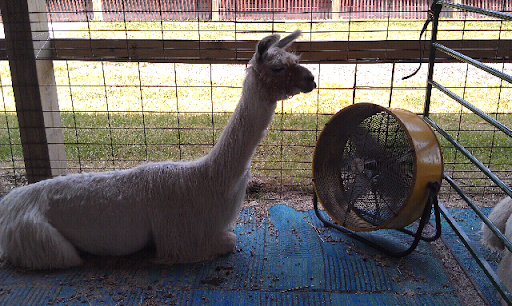 Wow is it hot outside! 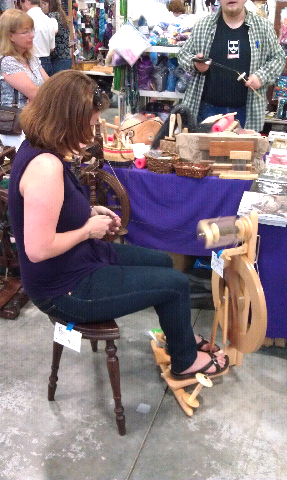 It is really difficult to pick up wool to knit when you don't even want to think about wool touching your skin. Given the weather, I was very excited when I was asked to review the free eBook from AllFreeKnitting.com: 15 Free Cute Knitting Patterns For Every Season. Here is a book that will help you keep knitting year round. The patterns are split into seasons with 4 patterns for each of Spring, Summer and Fall, and 3 patterns for Winter. (There are so many winter knitting patterns that I don't mind there are fewer patterns.) The eBook contains a lot of diversity, the patterns include lightweight tops, bags, dishcloths, throws, ponchos, Scarves, and Sweaters. 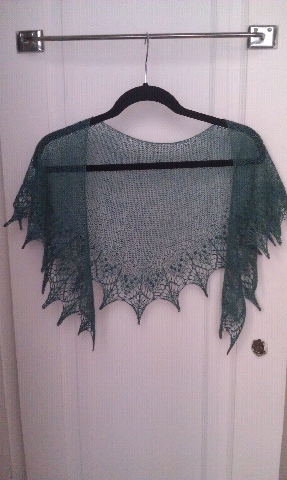 Normally when I think of summer I don't think of Ponchos, but the Lacy Summer Poncho has completely changed my opinion. This simple eyelet design looks cool both in terms of fashion and of temperature. It would be a great item to have with you in case the evening turns a little chilly, but it also shouldn't make you sweat! The other Easy Poncho Pattern fits better in another season because it doesn't contain the same airiness. The Short Sleaved Hooded Sweater (Fall) is adorible, but I would want to lengthen the ribbing at the bottom to make it more flattering on my body type. I love the Thrifty Market Bag (Spring). Knit market bags are fantastic for taking to Farmer's Markets because they won't make you sweaty by carrying them and they allow your produce to breathe. I am so glad that I know about this free eBook! I know that there are many warm weather knitting patterns available, but I was disappointed in a past search for spring and summer knitting pattern books. Now I see no reason to buy a book when you can get the collection in 15 Free Cute Knitting Patterns For Every Season for free! 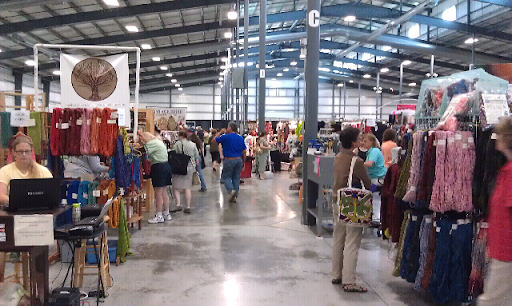 This the first time I am doing a non-free pattern search here at ChemKnits. The DNA helix scarf has been very popular with the science crowd, and since 2009 I have discovered many other fabulous DNA themed knitting patterns. 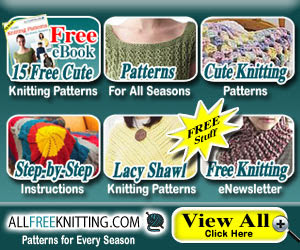 These patterns deserve mention here at ChemKnits, even if you would have to pay for the honor of knitting them. DNA Cable Beer Cozy - I designed this cozy to work out my own DNA cable knitting chart. 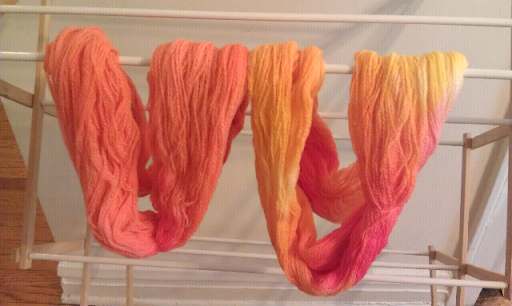 This was a swatch for a larger Kindle design. DNA Helix Kindle Cover - I wanted to create a Kindle cover for my Chemist father. I worked out the DNA chart in the beer cozy above and incorporated this cable DNA helix into a kindle cover. GENEie Collection - I designed 5 different patterns for the March for Science on April 22, 2017. These hats and headbands involve both cable and colorwork representations of the double helix. GENEie (Colorwork Version) - 10 colorwork strands of DNA run up the hat. GENEie (Cable Version) - 10 knit DNA cables run up the hat. 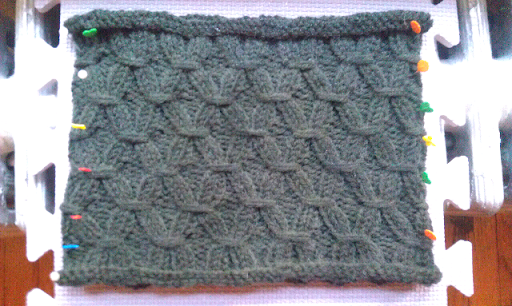 The cable is on a reverse stockinette background and is the same cable featured in the above beer cozy and Kindle cover. GENEie - The Next Generations - Maybe I should have named these hats and headbands plasmids because a strand of colorwork DNA runs around the brim of the hat. Toddler and adult sizes are available. GENEie Pussyhat - The iconic shape of resistance has two DNA cables on a stockinette background. One runs up front of the hat and the other runs down the back. 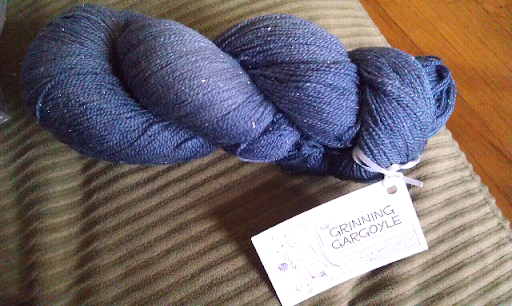 Of all of the GENEies, this is the easiest to adapt for different yarns and head sizes. 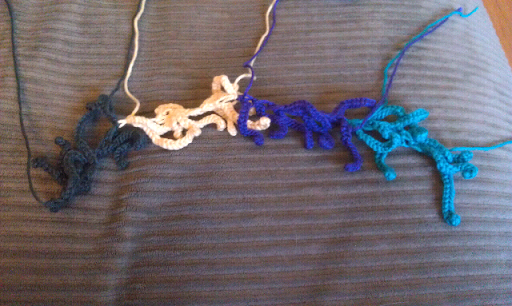 GENEie Plasmid - Now you can knit my DNA cable flat! I have provided a chart with WS and RS instructions in addition to written instructions to make this sideways headband. DNA Scarf - A beautiful scarf with the DNA helix running down the length. Eye of the Helix Socks - Deceptively classic looking top down socks, you may not realize at first that these are helical. Pattern is available as a free Ravelry.com download. You may need to create an account. DNA Hat - This hat has a DNA cable helix running around the brim of the hat. DNA Lace Scarf - The DNA helix is represented in a lace pattern rather than cables in this scarf. Pattern is available as a free Ravelry.com download. You may need to create an account. ProtoPretty DNA Sweater Shell - I was not expecting to see a DNA Sweater! 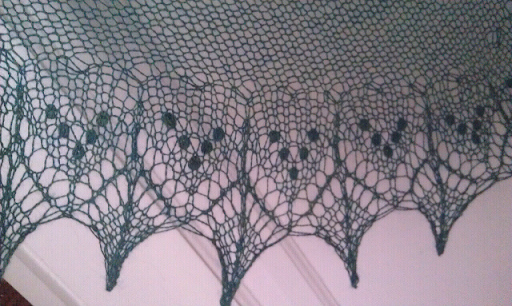 The helix runs down the front of this tank top and is flanked by some interesting lace. 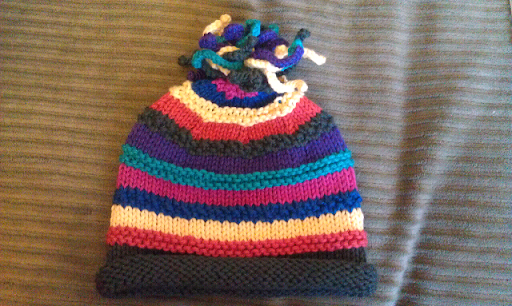 Central Dogma Hat (DNA --> RNA --> Protein) - In colorwork, you see the pattern go from DNA to RNA to protein as you start at the brim and go up to the crown of this hat. Pattern is available as a free Ravelry.com download. You may need to create an account. 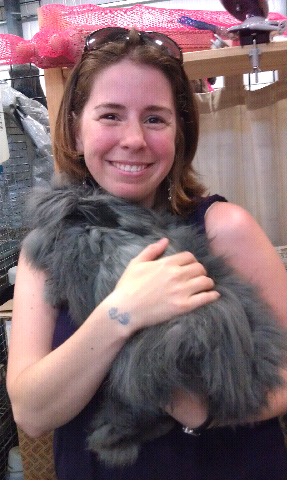 Rosalind - This is another DNA scarf, but once again there is a new twist (haha!) This is an illusion DNA scarf. Pattern is available as a free Ravelry.com download. You may need to create an account. Dreaming the Day Away Kindle Cover - Cover your kindle in a cabled DNA case. Pattern is available as a free Ravelry.com download. You may need to create an account. Chromosome Hat - You don't see the double helix here, but the brim of this hat is surrounded with an unmistakable (to a scientist at least) chromosome design. Chromosomal Flash Drive Cozy - In addition to the chromosomal cable design, there is an icord loop so you can attach the cozy to something. Baby's First DNA molecule - a 3D double helix. Maryanne's Splicable DNA - Another 3D DNA toy but you can "connect" different base pairs. Pattern is available as a free Ravelry.com download. You may need to create an account. 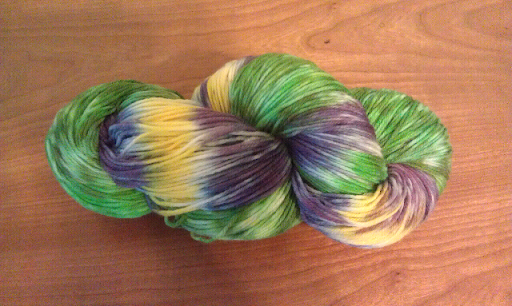 Denature - This is a sock pattern that I have been wanting for a long time. The helix cable splits ("denatures") on the gusset. $5.00 USD. Green Genes Socks - Sock with the DNA helix running down them. I love the title! $5.00 USD. Double Helix Socks - There is a double -double helix pattern down each side of the socks. 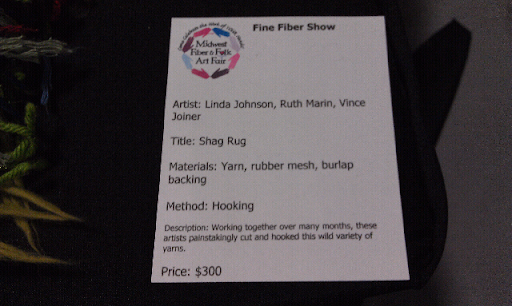 This is done through lace stitches. ~$4.79 USD. 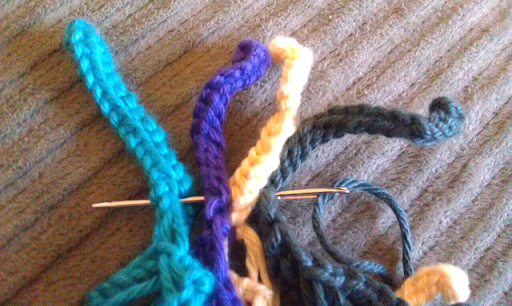 Knitting is in my DNA - A fingerless mitts pattern where the cabled DNA helix wraps around the hand. $5.00 USD. Imagine - A sock pattern where the helix rounds down the top outside edge of the foot. $5.00 USD. I hope you enjoy all of this helical goodness! 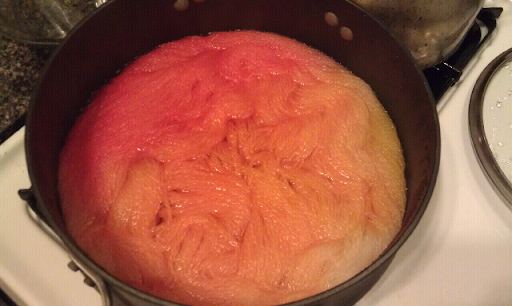 I is no secret that I love to dye yarn. I love to experiment with different techniques, but there is still nothing quite like handpainting yarn. 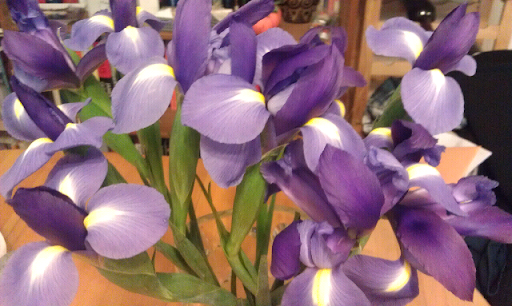 The Iris is my favorite color. 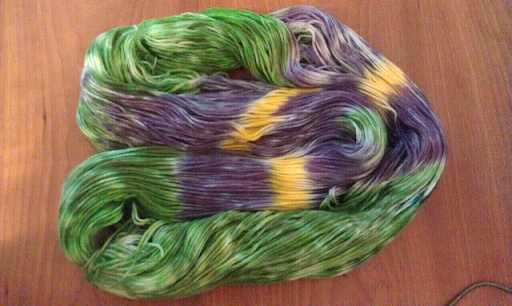 I love the shade of violet purple, the different green hues and the yellow surrounded by a hint of white. 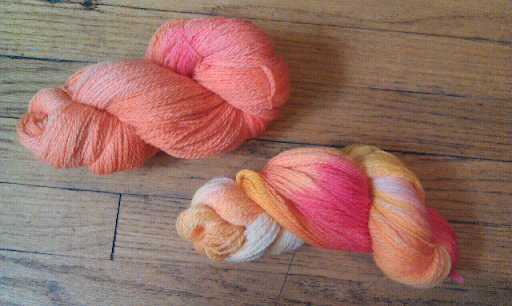 I used these colors as the inspiration for my Iris Dyed yarn. 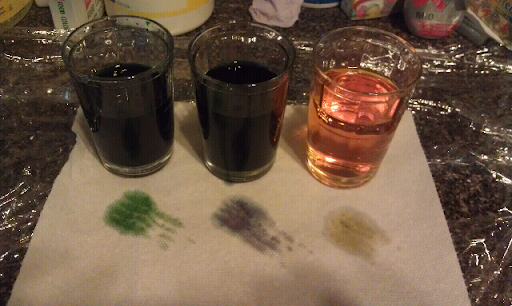 I mixed up three different dye colors in 2/3 cup of water. Yellow - 8 drops yellow. Green - 9 drops green, 6 drops neon green, 2 drops black. Purple - 8 drops blue, 5 drops NEON pink. In the end of my painting, I ended up doubling the purple and turning the rest of the yellow into another shade of green to get enough coverage on my 100g of wool/nylon blend (presoaked with a healthy splash of white vinegar). Irises haven't been my only inspiration lately. I have have been playing with my favorite colors, blue green and purple in the creation of this cool toned rainbow colorway. Do you want to know how I do it? Make sure you check out the following video and tutorial on how to hand paint yarn that I published in conjunction with AllFreeKnitting.